It is just so difficult for me to believe that the dude has had the thing since at least the '80s and thought it was a '60 the whole time?!? It seems like he'd have learned differently somewhere in all those years.. I used to love pawn shops until the internet f$$cked them up. I got a minty 1989 jtm45 for $500 before they started checking ebay. One thought, Randy Rhoads thought his Les Paul WAS a 1964. Information wasn't as available on these guitars, and getting is wasn't all that easy for how many years? In 1984 could you really tell that the Paul you bought was a 1968 or 1960? Did you know all the things to look for? Did you even CARE? I honestly think he thought it was a 1960, and never really looked into it. When my friend, who's playing credentials are up there, got his hands on my Chery Sunburst and dated by the serial number he REALLY thought is was a 1967! I had to show him how to date the pots and the information out there. No, because I turned 8 years old in '84. So did corey, of course the information was available to him. I'm just stating a different point of view, not everyone has adapted to all the information available on the internet on guitars. It's crazy all that's out there honestly, just 15 years ago most of what to MLP members as 'common knowledge' was not! Maybe someone who bought and sold instruments back then can correct me, but I think the average axe slinger, from novice to pro, didn't know the differences between a 1988 Les Paul Standard from a 1968 that was routed for the full 'buckers. Chances are yeah, he wanted to sell his guitar and make as much as he could off it and tried to sell it as a 1960 custom, he took it to a damn pawn shop. 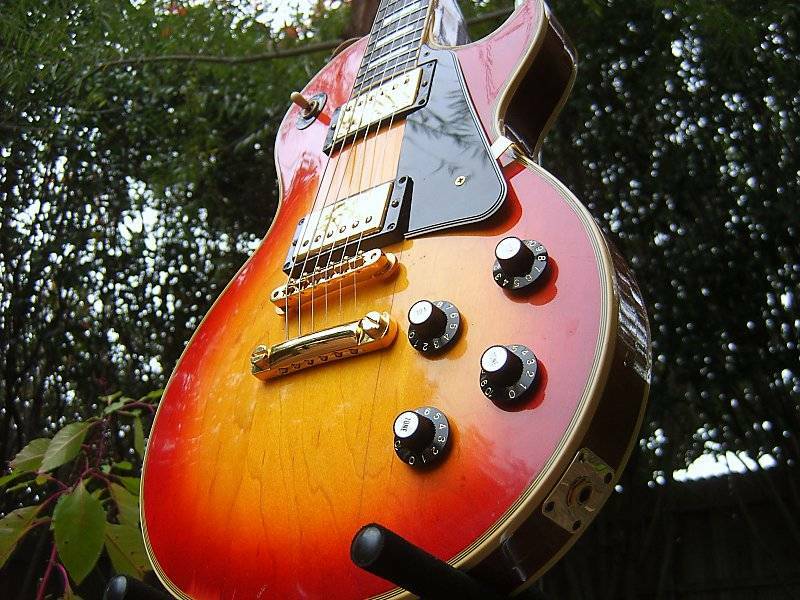 If the guy supposedly doesn't know much about les Pauls then why did he want it to be a '60? He was "disapointed" when he was found out. How can you be a pro LP player and not know what a PAF or a volute is? I'm calling BS. They should have broken that thing over his head and threw him out the door. Me too. I saw the telltale pancake line and was all jazzed that I knew it wasn't a 60...primarily because my wife was sitting next to me at the time. Not that she doubted me, but it's a little easier to justify periodically dropping a few thou on a guitar when you occasionally get to demonstrate that you do have some idea what you're talking about. Speaking of which, were witch hat knobs ever OEM? Though later on in the show they said it was a '74. I'm sure they didn't show everything, but wouldn't you have to look at the tenon to know if it was a 74? As far as him not knowing, he didn't seem like the sort of dude who hung out on an internet forum (he's probably actually out playing the guitar instead of talking about it), but I have a hard time believing the pancake body would've escaped being noticed over all these years. Maybe the owner was buddies with the dude who sold them the hot air balloon. "these guys will pay 50k for anything!!" Yes, I believe witch hats were standard knobs on Customs from '68 thru '73. Funny...Dallas guitar show twice a year for 5 years, I don't think I've ever seen that. I know, I hate witch hats... A ton of early Norlins had them though. Showing Bole witch hats is like poking a pissed pit bull with a stick! Damn ugliest knobs ever made. I love that show! I remember watching that episode and as soon as they took that custom out of the case, I could tell it was a Norlin. What a bummer for the guy if he actually thought it was a 1960. Thanks for the YT vid. Guy seemed genuinely bummed, but not sure how he hasn't heard of Google or calling Gibson. Not trying to be harsh!